Participants: Brent Stephenson (organiser), Steve Wood, Hadoram Shirihai, David Lawrie, Gillian Vaughan, Nigel Milius, Jane Hart, Bruce Mackereth, Geoff Foreman, Paddy Latham, and Maurry Martin (Skipper). We left the Whitianga Marina just after 0800 hours, with clear blue skies and forecasted ½ metre of swell in the open ocean. We had periods of cloud, but mostly the day was sunny, with the odd quick shower passing overhead. Swell was less than 1m at all times, and so a very comfortable trip, with no seasickness. Wind light breeze to start with increasing by late morning to about 5-10 knots. As we headed out of Whitianga Harbour we started to see small numbers of fluttering shearwaters, little penguins in ones and twos, and the occasional Australasian gannet. A little further towards the open sea and fairy prions started to put in an appearance, and then the occasional common diving petrel. 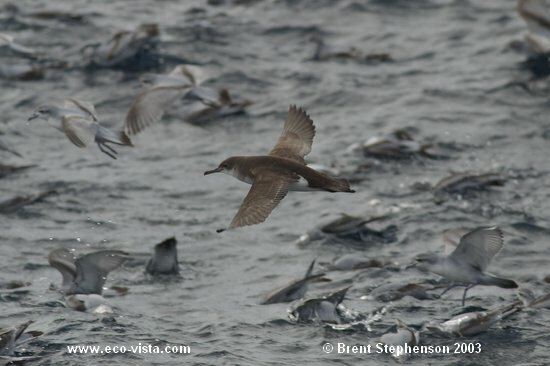 As we headed out on an easterly bearing into more open sea the numbers of fairy prions, fluttering shearwaters, and common diving petrels increased. Perhaps most surprising was the number of diving petrels with groups of 5 or more every couple of hundred metres, and scanning with binoculars revealed good numbers of this species. The light was excellent giving us excellent views of these birds, and excellent photo opportunities. 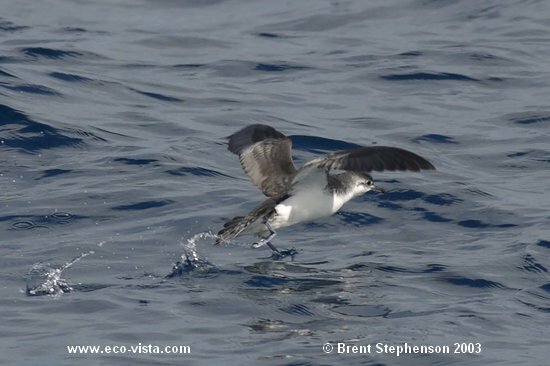 A fluttering shearwater with a large amount of white feathering was a strange sight. The bird had a predominantly white body, with dark feathers scattered throughout, and mainly dark wings, with a scattering of white feathers. As we got further out we encountered our first white-faced storm-petrels, usually ones or twos. Suddenly the call went up for ‘Whale’ and a small whale, possibly a Bryde’s whale, surfaced briefly about 100m from the boat, and sank again, revealing itself for only a second or so. We drifted, hoping the animal would resurface, it did, but again very briefly and this time several hundred metres away. We continued further out, after waiting sometime for the whale to resurface, through good numbers of fairy prions, flutterers, and diving petrels, although the later slowly started to become less common as we got further out. About 25 km east of Whitianga a large pod of 100+ short-beaked common dolphins were encountered, with the pod being very dispersed, with some coming into the boat, but most staying further out. They appeared to be feeding, with fairy prions, white-fronted terns, and flutterers associating with them. 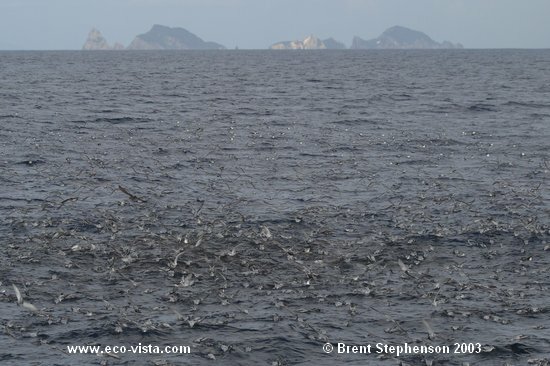 As we approached the pod 2 possible grey-faced petrels were seen in the distance. These were not seen again. The common dolphins seemed to disappear and shortly after that at about 1130 hours a huge school of mackerel (probably jack mackerel) were seen breaking the surface and huge numbers of fairy prions started feeding with the ‘meatball’ of feeding fish. This was at about 36º 45’ 718 S, 176º 02’ 033 E, in 120m of water. The water temp at the surface over most of the area travelled during the day was 14.6º C. We ended up spending about 2 ½ hours following the school of fish and associated birds. 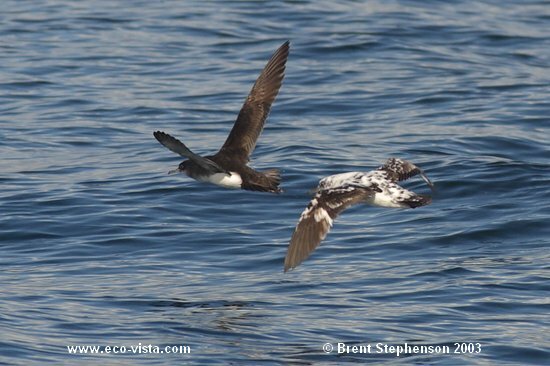 The flock contained an estimated 1500-2000+ fairy prions, 30-50 fluttering shearwater, and the odd common diving petrel. The call went up for little shearwater, and we had excellent views of several (at least 2) birds of the race haurakiensis. The birds were spotted intermittently within the frenzy, several times coming close to the boat, but never as confiding as the prions and flutterers. 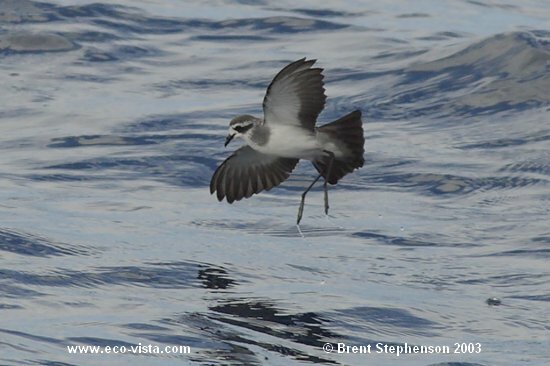 At least 3-5 white-faced storm-petrels fed closeby also. 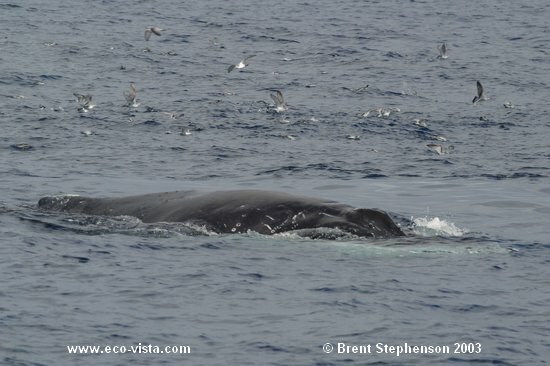 At 1215 hours the call for whale went up again as a young humpback suddenly surfaced near to the boat. Clearly not what we had seen before this animal surfaced several times near to the boat allowing amazing views, and at one point surfaced within about 70m of the boat, then passed closer by just under the surface. Everyone on board had fantastic views and we watched it surface about 10 times before it finally disappeared. We continued following the mackerel school, hoping that something else would turn up, and despite spending a lot of time looking at the prions only fairy prions were seen. At about 1335 an immature black-browed albatross arrived and landed amongst the feeding frenzy, quickly gulping down several mackerel. It was very wary and did not allow close approach, and after making several passes of the boat, it flew off. We departed not long after, from about 36º 50’ 187 S, 175º 59’ 067 E at 1410 hours, and headed due west back towards the coast. Just after heading in a sooty shearwater made a single pass, and then shortly after two ‘Cookilaria’ type petrels were seen. 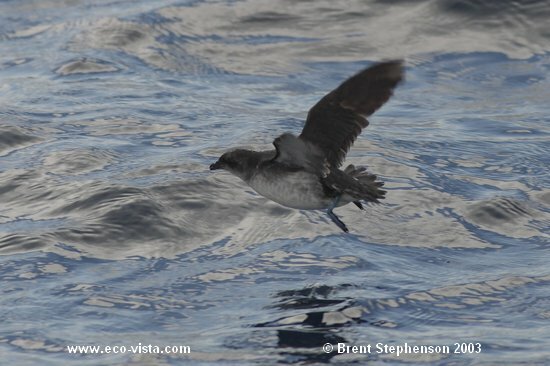 There were still large numbers of diving petrels and fairy prions about as we motored in. Nearing the coast, we followed the shore back around and into Whitianga Harbour, arriving back at the Marina at about 1700 hours. A thoroughly enjoyable day with yet again some great surprises and excellent birds/mammals! 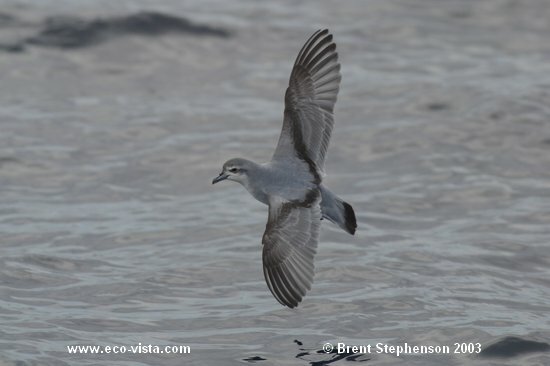 Surprising omissions were Buller’s and flesh-footed shearwaters and more of the ‘Cookilaria’ petrels – it was obviously still a bit too early in the season. Part of the huge ‘frenzy’ feeding in association with mackerel, mainly fairy prions in view. In the background (to the south-east) are the Alderman Islands.